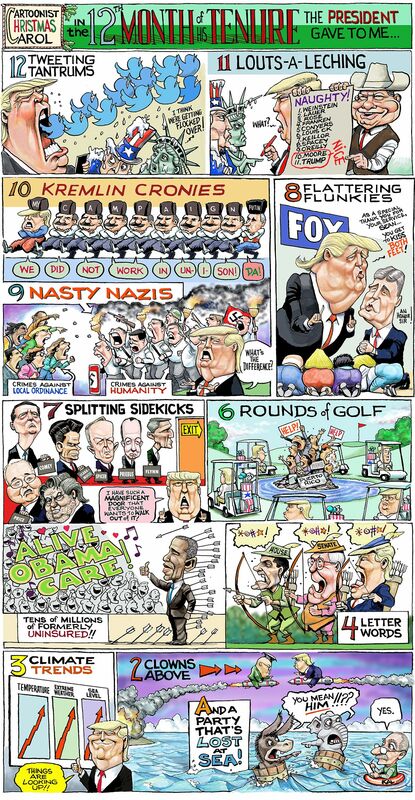 For many political cartoonists the end of the calendar year is an opportunity to assemble the best of their year’s output for a roundup that will appear in print and online. In the past few years the Baltimore Sun has invited me to create an original piece of art to mark the occasion. They provided me with a two page spread to fill and this year I took the opportunity to experiment. For the first time I eshewed my traditional watercolors and gouache to play with pixels. I painted an entire cartoon digitally. I suspect that in 2018 I shall be experimenting more with this method.